There are three computers labs in the school, one each for Junior Wing, Secondary Wing and Senior Secondary Wing to impart computer education to the students. The labs are equipped with the latest computers having 2nd generation i5 processor. Computer Science is taught as a compulsory subject from classes IV to X and as an elective subject for classes XI and XII. The curriculum up to class X has been designed with an innovative approach so as to keep abreast with the latest technology. 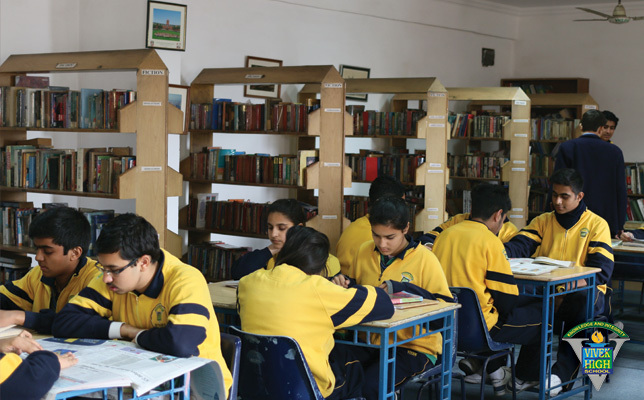 Senior Secondary classes follow the CBSE curriculum. The Vivek High library is an active learning and resource centre for staff, students and parents. The collection of books is large and varied. The quality of books and the rich variety of texts available is the hallmark of the library. Spacious, comfortable and tranquil, the environment is that which encourages and stimulates reading and research interests. The Vivek library has over 10,000 books. It subscribes to several newsletters, periodicals, magazines and newspapers. It is equipped with audio-visual equipment and a collection of compact discs, movies, documentaries and slides. Email and internet facilities are available in the library. 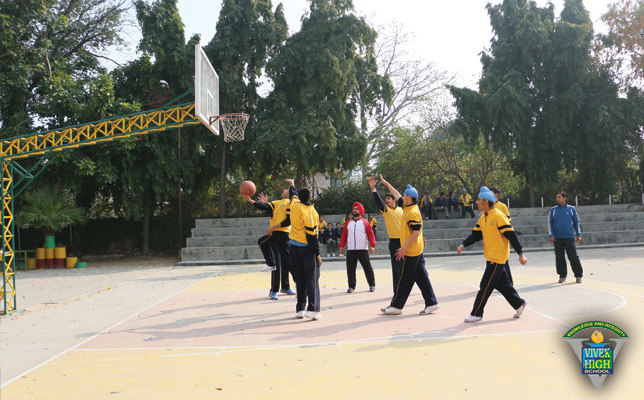 The school has a two basketball courts, an outdoor badminton court, two volley ball courts, . Besides this, we also have a standardized football ground, practice pitch for cricket, gymnastics apparatus and a standard 200m track. Action begins early morning at about 6:00 am where specialized training is imparted to students in different disciplines of games and sports and carries on till late evening. Parents who wish to avail of the school bus facility should confirm the bus route from the school office. The bus route will not be changed. The bus fare is subject to change. Note: Transport fees once paid will not be refunded. The School does not take responsibility for any private transport. All the students should obey the staff/monitors, the driver and conductors of their respective buses. Staff/monitor should check the entry of a new person in his/her bus. Any quarrel/fights and disputes, should be reported to the concerned authority of the school, the bus in-charge, co-ordinators, Vice-Principal, Principal at the earliest. Indisciplined behaviour in the school bus will make the student ineligible to use the school transport. In case of any mishap in the bus, please inform the school office immediately (Ph: Chandigarh 0172-2698988, Mohali 0172-4621747). Safety Saves- students must avoid unnecessary movement in the bus. Travel in the bus is permitted only after the permission of the concerned authority is taken. Students are advised not to get on/off the bus while it is moving, or at the traffic signals/crossings, etc. Advance information in writing must be sent in case the child comes in the bus to the school in the morning but does not intend to use it to go back home on a particular day. 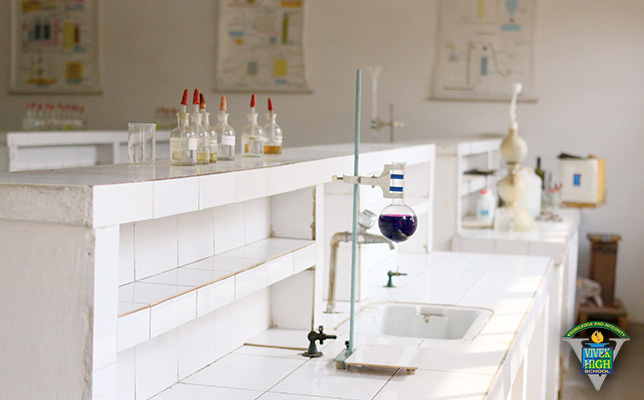 There are three science laboratories, one each for Biology, Chemistry and Physics. Modern in style and content and well stocked with equipment, instruments and data, the laboratories offer a rich experimental atmosphere and support. The laboratories are well lit, airy and spacious and every student gets his or her own workstation and equipment. The school tuck shop is housed in a specially designed, eco-friendly structure. Hot and cold beverages, fruit juices, Indian snacks, sandwiches, soups and a variety of foods to suit the students' palates and tastes are available. It is the endeavor of the school to gradually wean the children away from the trend of fast foods and introduce nutritious and wholesome food into the menu. 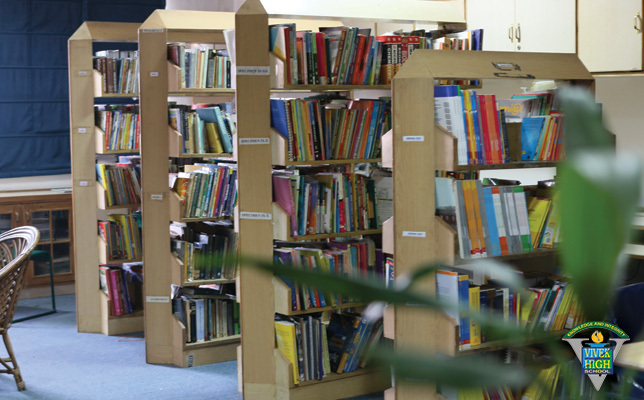 The school book shop has the requisite materials required for the school -like text books, notebooks, the school diary, school track suits, ties, belts, badges etc.